Once again, an update has been overdue, but once again, things have been up in the air and changing so quickly, it’s been hard to know how to fill you all in without changing the plan/outcome every week or so. Here’s where we are: I am back on long-term disability due to increasing pain caused by infected lymph nodes pressing on nerves and organs. This pain has affected my mobility, which has been especially hard. Thankfully, I’ve been working with palliative care and now have the right pain medicines, so this is beginning to improve. Once again, I miss teaching, but I’m glad for opportunities to still volunteer some in the classroom, and that I am able to stay home when I need to. I have also been working to get into an immunotherapy clinical trial, and finally, I think it’s actually going to happen. It is a Phase 1 Interluekon-12 trial (aka immunotherapy). It is a 28-day treatment cycle. I will begin treatment Tuesday, April 14 in Bethesda, Maryland, and return home Thursday, April 16. I’ll go back just for the day the next two Tuesdays, then I have a week off, and then return for another treatment where I’ll stay again for four days. The outcome we are hoping for is stable disease (no growth). We can also hope that this will improve outcomes when I return to conventional treatment at some point in the future. So that’s the clinical stuff. Otherwise, we are plugging along, trying to maintain some normalcy in our lives. Oscar started soccer a few weeks ago, and will return to swimming lessons next week. He’s reading up a storm, and already talking about first grade. John is drawing and painting and plans to take part in POST (Philadelphia Open Studio Tours) in the fall. I am still knitting, and I’ve recently noticed I now have eyebrows and eyelashes. Exciting stuff. 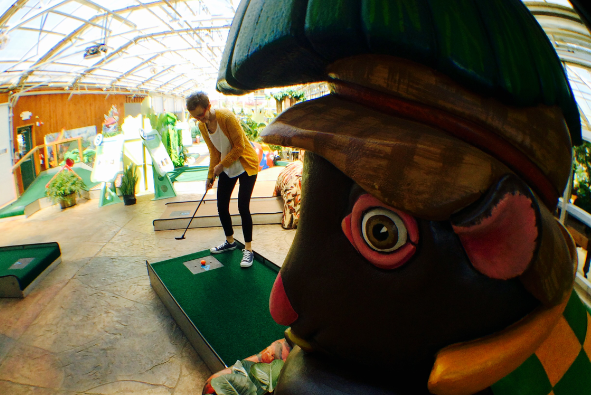 On Monday, I even managed to mini-golf with John and Oscar. And we’ve been blessed with friends and family that continue to show us care. One friend brings us dinner every Sunday, giving us extra time together before the week begins. Another friend coordinated meals and childcare when my mobility was really bad. Through this coordination, even more friends signed up to bring Oscar home from school, or come over and help with dinner and bedtime. Another friend gave us four weeks of a meal service called Blue Apron–three nights a week we didn’t have to think about dinner; instead, we just cooked up what was in the box. Another friend paid to have our house cleaned. And still more friends have taken Oscar out for the day, or even for sleepovers, giving John and me a little extra time together. Still more friends and family have sent cards, thoughtful care packages, and messages of support and love. You continue to remember us, even as this “stuff” seems to goes on and on. To experience this kind of love is humbling (and at times, overwhelming). We are beyond thankful. Here’s the direct link to her Go Fund Me post.